In this polymer clay and resin tutorial I explain how to make two sets of faux lampwork glass beads with abstract design and dimensional round dots. The color schemes and designs I offer in this tutorial are created to closely resemble some of the typical patterns seen in the real lampwork beads. These designs are just an example of the possibilities of this technique. 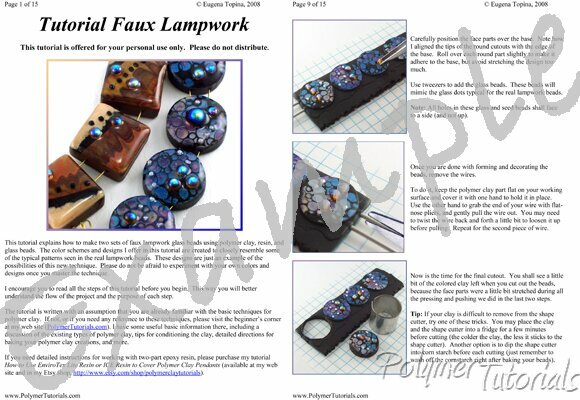 The first two pictures on this page show the bead sets described in this tutorial. The last two pictures demonstrate the possibilities of the techniques explained in this tutorial. Place a mouse over the small pictures to see them enlarged. Even a beginner can create great beads with this teacher! ..